flame retardant polymer for durability and long life. It comes complete with all accessories shown above. It also features over-heat protection. Filtration - A self contained HEPA filter cartridge for lead dust, mold spores, etc., reduces the risk of particle dispersion. 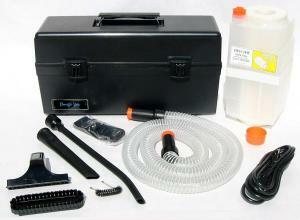 The cartridge filter makes filter changes easy, clean, and safe. Powerful and Quiet - Get the job done quickly and quietly! 16” flexible wand is pliable and will fit into hard to reach places.